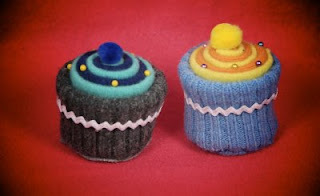 The Restitcherator: Cupcakes from Betz White's "Warm Fuzzies"
The book that started me off and running on this whole craze of cutting up felted sweaters to craft with came from purchasing a book called "Warm Fuzzies" by Betz White. Her signature item is a cupcake pincushion, and I made one for myself and one for a friend. They were really actually not that difficult to make. One of the reason I love Betz' book so much is that there are great, step-by-step picture instructions. You can see how she puts things together, in addition to reading about it. Her website is www.betzwhite.com. She's got an amazing blog, too.